Home / Non-Surgical / Non-Surgical Fat Removal Videos / Removing fat without surgery: Is it too good to be true? Removing fat without surgery: Is it too good to be true? Increasingly consumers are being exposed to a new facet of cosmetic surgery: non-invasive fat removal. Multiple medical companies have devised advanced technology that work to eliminate fat without patients having to go to the operating room. CoolSculpting, Liposonix, and Vanquish are three devices that operate in different ways, but towards the same goal: offering an option for patients to have some fat removed without surgery. 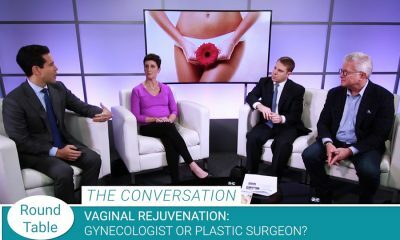 The first question is obvious: “Do they really work?” The Plastic Surgery Channel doctors sat down to answer that question and discuss how important this technology is to patients and physicians alike. Even considering that liposuction is an incredible procedure, many patients simply do not want to undergo surgery. In comes the new devices, ready to offer a large population of people something that has never been offered before: fat removal without surgery. Whether the fat is frozen, heated, or zapped, the cells slowly pass away through the body, leaving a reduction of fat in the treated areas. The devices really do work, although removing fat is only part of the story. Will Non-surgical options ever measure up to Liposuction? Dr. Robert Grant of New York City reminds the panel of the best non-invasive fat removal tool that’s been tried and tested: diet and exercise. “Stepping back for a second, we already have a great non-surgical way of removing fat: it’s called diet and exercise!” says Grant. Bottom line? The new devices are working well, but don’t accomplish as much as surgical liposuction. Maybe for the patient with just a small pocket of fat non-surgical options might be used instead of liposuction. In the patient who has contour-irregularities and larger, more stubborn fat pockets, liposuction would not only achieve more but be more cost-effective, even though it’s surgery.